Satisfied customers is really what we want! And we work hard to keep them happy! In July 2006 JADE created a Quality Policy and Quality Management System (QMS). As the result JADE received it's ISO 9001:2000 certification on December 4, 2006. We received our ISO 9001:2008 certification October 9, 2009. JADE's Quality Management System (QMS) dictates that our Management Team interacts with our workforce daily, stressing the importance of manufacturing springs of the highest quality possible. JADE's Quality Policy helps our entire workforce understand that customer satisfaction can only be achieved if the product quality is maintained at the highest level possible. 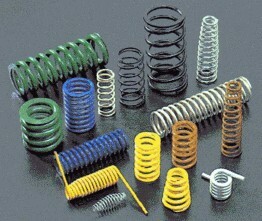 And that each and every spring manufactured by JADE is exactly to print, thus fulfilling our customers expectations. JADE'S Quality Management System (QMS) and Quality Policy are periodically reviewed to assure their effectiveness in achieving the highest level of product quality and customer satisfaction in the industry. Timely deliveries – JADE recognizes the importance of on time deliveries. arrangements or paperwork at a moments notice to aid our customers. member of the Spring Manufacturers Institute.